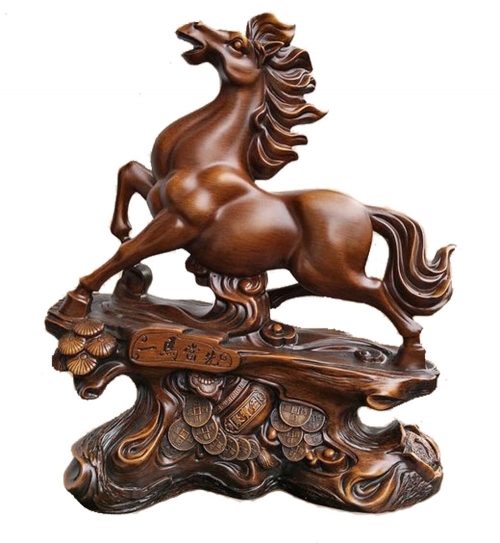 The horse is a universal symbol of endurance, strength, power, victory, success, and independence; this auspicious brown horse statue is perfect for display on a desk, home, office, room,etc. This beautiful big brown auspicious horse statue is crafted with excellent detail and has a smooth, fine texture. The horse is standing in a powerful stance, and stands on a base with Chinese inscriptions of resilience and good fortune. The golden coins on the base also increase financial luck and career prosperity. Placing this gorgeous big horse figurine in your home or workplace will enhance determination and ambition for all your career and personal goals. This statue will aid you in conquering all your ambitions and goals this year with vigor and persistence. It is made of polyresin. The dimension of this big horse statue is approx. 12" x 6" x 14".